I spend a lot of time underground compared to most travellers, I think. I’m always looking around for good caves in any country I visit. And a lot of caves tend to be in somewhat remote areas, so it’s a good excuse to get off the tourist trail. This is the sixth article in the series of World Tour Highlights lists. In it I present the 20 caves I’ve known and loved during the trip, in the order I visited them. These are only traditional solution or erosion cave systems - I haven’t included sea caves, lava tubes or other types of caves. A show-cave in the heart of the Rock of Gibraltar, and one that has seen much use in its time, as a concert hall and military installation among other things. Some interesting flowstone, but the dryness of the walls and the air in the cave and the lack of dripping noises made me think it’s no longer an active cave system. A very stylized set of tunnels and grottoes running under the grounds of the UNESCO World Heritage-classified Quinta da Regaleira. 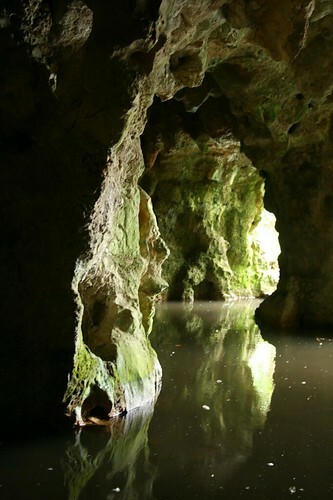 Pillars run down from the grotto ceilings to the still green water, and the whole site is an allegory for the enlightened soul’s journey out of darkness. It’s not clear to me how much of the winding tunnels and subterranean lakes is natural and how much is constructed or altered, but it’s lovely and strange and spooky nonetheless. The first of three excellent caves we visited in the Moravian Karst in the Czech Republic. 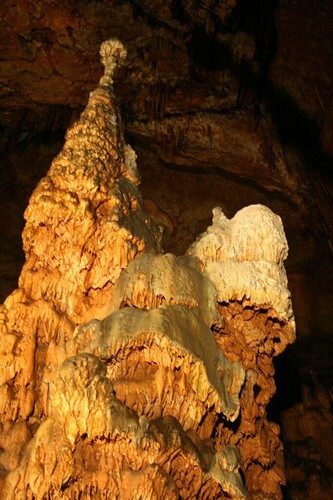 Rich in dripstone and flowstone formations and with an underground river and lakes system. A show cave, but a very tastefully-done show cave, with subtle lighting and well-integrated walkways. The first cavern is one of the largest I’ve seen. The second of the Moravian caves. 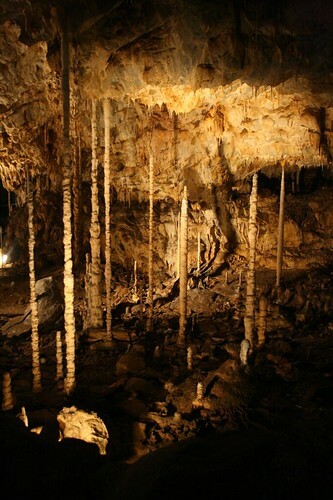 Much smaller than Punkevní but with a good forest of stalactites and soda straws. The third and best of the Moravian caves. One of the most visually rewarding and intricate caves I’ve seen. Every step was something new. An hour and a half tour led by guides with an obvious passion for caving. A cave below the city of Budapest. Accessible only by guided tour by a private company, and a disappointing muddy scramble with nothing much to see except for some small gypsum flowers. The finest cave in Hungary, although in fact it’s just the Hungarian end of the Baradla-Domica system which extends into Slovakia. Remote and hard to reach by train, but worth every moment. 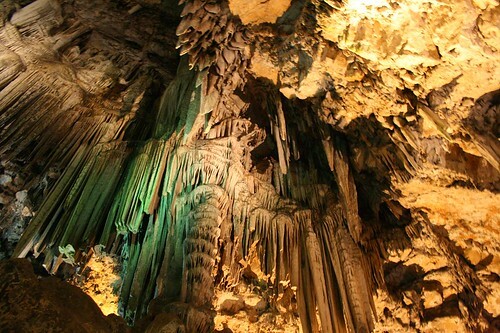 A spectacular set of huge linked caverns, with vividly coloured rock and lots of dripstone, but terribly damaged, since in the last century visitors to the cave were allowed to break off pieces of the stalactites to take home as souvenirs. 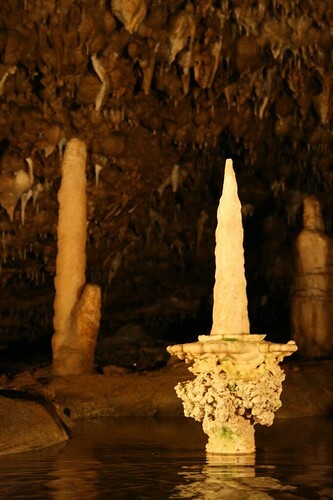 The centrepiece of the caves is a 17-meter stalagmite topped with a massive flower of calcium. Not technically a second cave, but another entrance to the massive Baradla-Domica cave system that straddles the border between Hungary and Slovakia. The Slovakian end of the system is possibly better than the Hungarian end. I’m still undecided. Normally flooded and accessed on a boat trip along an underground river, it was dry when we visited. This cave was my first experience with the bizarre speleotherm called cave shields - disks of rock hanging from the cave ceiling and fringed with stalactites. This was a cave on private land that Sheryl and I paid to take a tour through. It’s still one of the best caves I’ve ever seen. Hours of mucky, wet, muddy, beautiful caving. Tight squeezes, vertical chimneys, and a guide who actually took our word that we knew what we were doing and took us into a few of the passages and chambers that normal customers don’t usually get to see. This cave had speleotherms I’d never seen before, or even heard of. 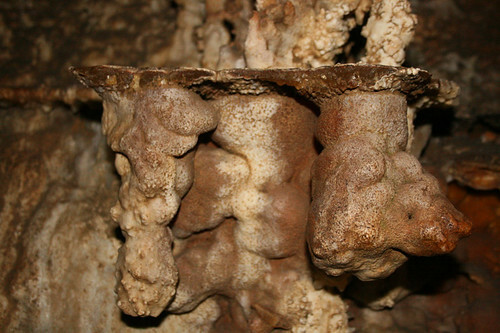 Amazing geode chambers, huge twisted helictites, even deformed soda-straws. 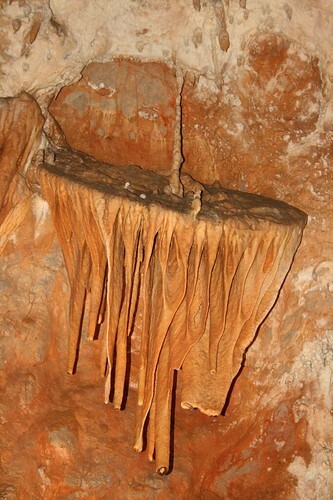 There were so many formations, so densely packed, and in perfect condition – I feel lucky to have seen this cave. My only regret is that it was too wet for cameras. Another show cave, near the private cave in Outdshoorn, above. That cave had been incredible, but we didn’t expect anything close from this one. The basic tour took you through a big, sterile, well-lit and practically wheelchair-accessible route. We opted for the longer “adventure” tour which involved some tight squeezes and climbs. The cave system actually had some neat formations, including a few corkscrew helictites and some really excellent shelfstone. I’m sure it has a name, but I never knew it. While in Zhangjiajie, a geologically stunning area of limestone spires in Southern China, Sheryl and I got off the main track and followed overgrown footpaths in an attempt to avoid backtracking. It didn’t work out, but it did lead us to find a big cave system. It had a dirt floor and not much in the way of rock formations, but it did have lots of bats who weren’t happy with us for disturbing their sleep and kept squeaking and swooping at our heads until we left. That’s actually its name, not my description. A visit was included with our boat trip on Halong Bay in northern Vietnam. 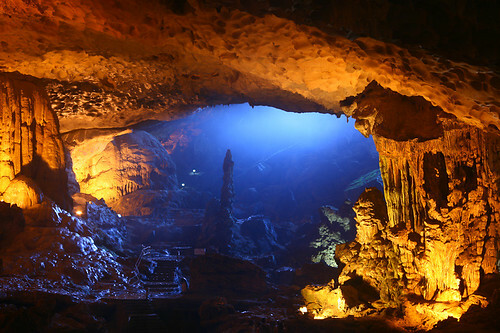 Halong Bay is dotted with fascinatingly-shaped limestone islands, and the Amazing Cave is on one of the larger of them. If it hadn’t been free, we wouldn’t have bothered. Guided tours, gaudy hot lights causing rampant algae and moss growth on the rock, and thousands of visitors daily; not a recipe for a happy cave. A couple of interesting big dripstone pillars, but that was about all. An hour’s travel by bicycle from the tourist town of Kep, the cave is named for the rock formation at the entrance, which looks vaguely like the head of an elephant. The limestone hill that rises above the flat rice paddies like a pimple is riddled with crevices and caverns, and is crowned by a Buddhist monastery. The caves are scattered with tiny shrines in every corner; incense offerings and gold-painted statuettes wedged into cracks in the walls. 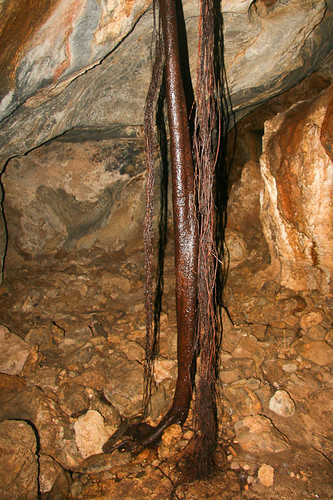 Huge, long black roots like ropes dangle from the cavern roofs where the ancient banyan trees have pierced the rock. The cave is populated by little brown bats that flutter around your head. Looking into an offshoot branch of a tunnel, I surprised one bat and he flew right into my face. The taste of wet bat fur and the scratching of his little claws isn’t something that I’ll forget in a hurry. One of the more unique caves of the trip. It was an hour’s bike ride outside of Vang Vieng near the village of Ban Nampa and situated in an area of karst outcrops and spires. It’s a stream cave some 3km deep with various passages. The entry passage is guarded by a large Buddha statue. We were barefoot most of the way - the first time I’d ever had my shoes off in a cave - wading through muddy water up a series of calcite rimstone terraces. Low ceilings at points and a couple of tight squeezes. The slippery mud had us on our backs more than once, and it was deep in spots - I went in past my knees, but wading through the water trapped in the terraces soon washed us off again. The walls are marred with notes and directions from caving expeditions past, but the route is confusing in a few spots and we were glad of their efforts. Some very good flowstone draperies, including nice “bacon strips”, and very cool calcite crystals forming skins in the still water under drips from the roof. Loup Cave is very close to Hoi Cave, above. An awkward climb down slippery wooden steps at the entrance, and then a few big caverns with some excellent stalactites and stalagmites. 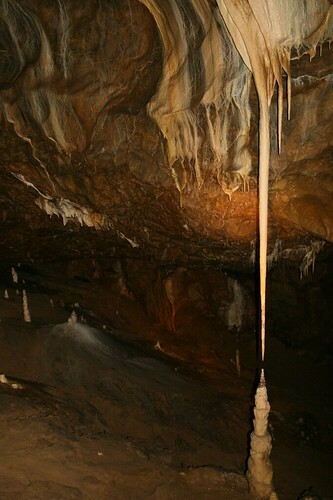 The cave seems to flood regularly, since many of the formations were slicked with mud, and the floor was lined in spots with mud ridges like terraces. Farther back it was less trafficked and less damaged. There were a couple of neat spots with soda straws and a helictite or two. An interesting set of caves in Borneo. They aren’t rich in speleotherms, but rather in history. The Traders’ Cave was used until recently as temporary housing for families of workers gathering swiftlet nests from the roof of the Great Cave. 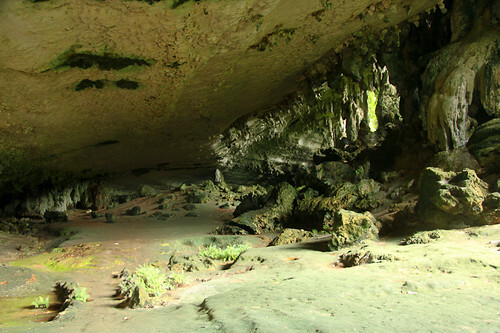 The Great Cave is a truly massive cavern with a roof some 75m high and festooned with bat colonies and swiftlet nests. The noise can be deafening at times, the floor is thick with guano deposits and the smell is quite strong. During the harvesting season, workers climb the lashed-together poles up to the high ceiling to collect the swiflet nests. A guano-covered walkway leads up and to the back of the Great Cave, where smaller passages run outside to the Painted Cave. Both these caves are important archaeological sites, having been inhabited since the Paleolithic era 40,000 years ago. Artifacts and human remains in the Great Cave identify it as an intermittent settlement, and the Painted Cave contains, besides its petroglyphs, an excavation of wooden “Death Ship” coffins. Developed show caves with steel catwalks. The usual high-school girl with flashlight and memorized script leading the required guided tour. Some very good dripstone. The place is supposed to be full of brown tree snakes sheltering in the rock crevices, but we didn’t see any. Overgroomed show caves geared toward education of kids, and not very interesting. There are less-developed caves you can enter on expensive guided tours, but we didn’t pay for them. 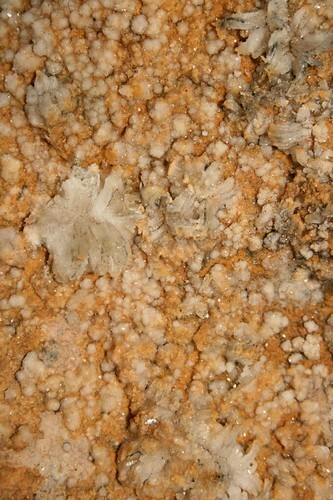 The caves are mostly important for their fossil deposits. We were there to see the bat colonies come out at dusk. Clifden is an undeveloped cave system which is often flooded. Some big spaces and some very tight squeezes, acrobatics and contortions, and one nervous edging on a sloping wall around a deep pool of water. The route is marked with reflectors fixed to the rock. Some neat flowstone draperies with toothed edges. Quite badly damaged in a lot of spots with scratched graffiti. 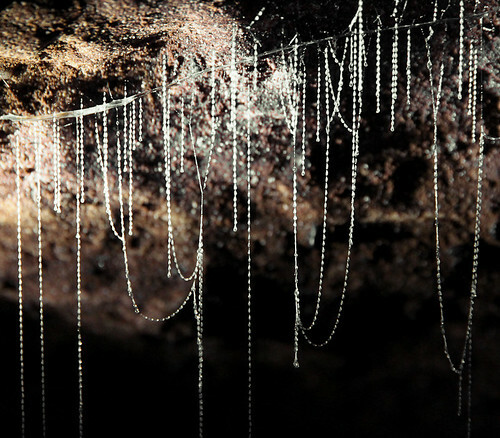 The best feature (and the reason we were there) was the glow-worms. Day 2 of the Kepler Track is difficult enough without doing some caving too, but Sheryl and I did. 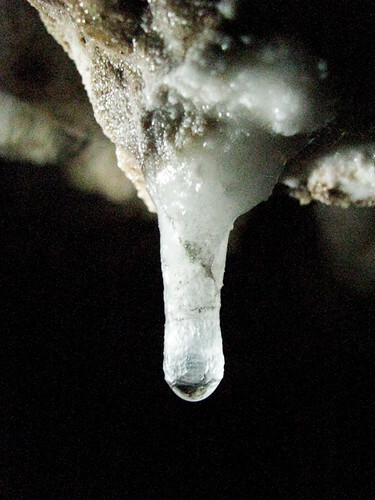 Luxmore cave is really one long unbranching passage worn by trickling water running down inside Mt. Luxmore toward sea-level. We really only had time to go in (down) a couple of hundred meters. Being such a straightforward, narrow and well-trodden cave, there’s not much in the way of formations.